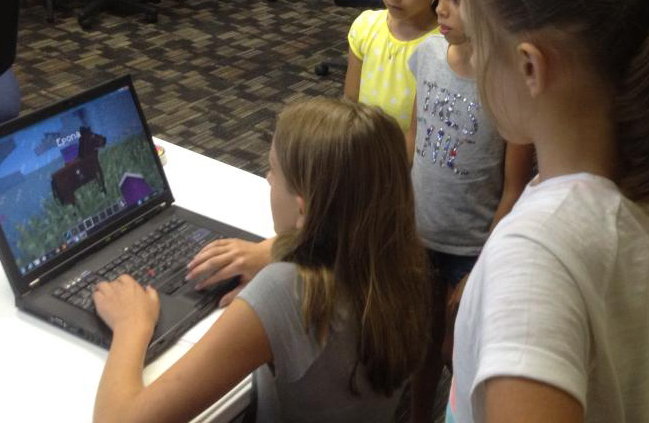 How We Used Minecraft to Teach Girls to Code in Kentucky and Indiana | Not Another Brittany! When I think back to 1998, I remember the awkwardness of transitioning into middle school. I remember my fresh braces, the mommy-cut bangs with OH-SO-MANY cowlicks, and an embarrassing amount of Savage Garden. (That chick-a-cherry cola song was my jam – but let’s not talk about that right now.) But the main thing I remember from 1998? Staying up late on school nights, trying to muffle the hissing of our AOL dial-up internet, so that I could surf HTMLgoodies.com and teach myself how to code. Were there were any female web designers in the world? Were there any other kids my own age who were into computer programming? If so, were there any in my own state? Thank goodness it’s not 1998 anymore. When Velocity Indiana announced they were looking for people to help launch coding classes for Kentucky and Indiana kids back in 2013, I was thrilled. There’s so much more potential to get kids interested in coding when you have a structured, supportive classroom environment. The Velocity Indiana classes not only allowed children to learn alongside their peers, siblings and friends; the classroom environments were also smaller and more intimate, with one-on-one mentoring from adults who actually write code for a living. Reviews from our first class, which met every week for four weeks, were positive. Around that same time, the New York Times released an article titled “How to Get Girls Into Coding.” Naturally, this sparked some discussion among parents, educators, and web developers. Velocity Indiana soon began receiving requests from parents for an all-girls version of the class we had created. “Demand” for an all-girls class is an understatement. When we launched an all-girls coding class in Jeffersonville, Indiana, just across the border from Kentucky’s largest city of Louisville, not only did the class completely fill up… but there was even a waiting list to get in! Being a female in tech myself, I jumped at the chance to come on board and teach the girls. Many people in the Kentuckiana community (men and women) personally thanked me for helping with this type of a class. A couple parents even reached out about enrolling their daughters in similar classes in Kentucky. What I couldn’t anticipate, of course, was how the students (and parents) would respond to the class. I had hoped to inspire the girls (who were between the ages of 7 and 13 at the time) to pursue STEAM (Science, Technology, Engineering, Art and Mathematics) careers, similar to how I had been inspired when I was around the same age as some of them. But I really had no idea what to expect. I suppose none of us did. The students were engaged, eager to learn, and this class had a sense of camaraderie like I’ve never seen before. Several girls mentioned how excited they were to be learning in an all-girls environment. They felt more comfortable and more engaged. Some students and parents requested that we all stay in touch after the class was over. Many of them were inspired and eager to participate in additional classes, including more advanced coding courses. Since the launch of our coding classes for boys and girls between 2013-2014, a lot has changed in the Kentucky and Indiana tech scene. Girl Develop It and iD Tech now have a presence in Louisville, along with some other fabulous groups, and organizations like Girls Who Code continue to grow in popularity. An hour south of Louisville, Awesome Inc in Lexington offers coding camps for children. I have had the immense pleasure of working with 3 or 4 of these groups and am very optimistic about the leadership in Kentucky’s coding classes in particular. Meanwhile, I think it’s a safe bet that the movement to get more girls writing code will continue its momentum. It’s been extremely thrilling and rewarding helping launch this program and also getting to teach students at iD Tech, Awesome Inc, Winburn Middle School, and other institutions. This is a cause that is very close to my heart, personally, and I’m so glad these classes are helping introduce other girls to potential STEM careers. These girls are my heroes and I’ve had so much fun teaching and mentoring them. So yes, I’m thankful it’s not 1998 anymore. And I’m thankful for all the organizations out there who are striving to teach kids to code – and to change the ratio of diversity in tech.